Spider management is an important portion of the pest control dollar and there are numerous chemicals on the market for their control. Many of the pesticides used around homes are water-based, because they don’t have an offensive smell and don’t leave an oily residue to which dust and dirt adhere (as do oil-based pesticides). However, this leads to an interesting conundrum. The external silk layers of many spider egg sacs are hydrophobic; that is, they repel water. This makes sense because when a spider lays its eggs, it wants to protect them from environmental threats such as rainfall. But what does this mean for the PMP? If a pesticide uses water as a carrier, does its active ingredient (AI) impact the eggs within an egg sac? THE EGG-SAC TEST. We investigated this interesting question with the brown widow spider as a model for most spider egg sacs. In the first decade of this century, the brown widow spider has become a significant urban pest in Southern California and in the Gulf Coast states. It has a characteristic spiked egg sac, which has allowed people who are usually not very adept at insect or spider identification to accurately identify this species when it takes over their patio furniture and garden areas. This spider also was selected because it is so plentiful and prolific — the female can produce an egg sac every four days when young, average about 130 eggs per sac and lay more than 20 egg sacs in a lifetime — enabling us to collect large numbers of them in a short time and efficiently test egg sacs in pesticide tests. In the first series of tests, we chose five commercially available, water-based pesticides commonly used by PMPs. (The product names aren’t critical, but they are listed in the publication referenced at the end of this article.) We also chose one aerosol product that contained petroleum carriers to see if it had a different effect than the water-based pesticide products. About 150 female brown widows were collected, fed mealworms and checked every day for egg-sac production. Egg sacs were removed from females and given a date of production so we knew exactly how old the sacs were. We tested each pesticide against 18 egg sacs: six of each that were one day old (so they were eggs), 12 days old (so the spiderlings had hatched inside the egg sac but were still developing) and 17 days old (with spiderlings about to emerge from the sac). By using sacs of three ages, we covered the span of lifeforms that PMPs would be experiencing in the field. Egg sacs were treated by spraying pesticide on one side, as would likely happen in the field, and left to emerge (usually by the 20th day). If nothing had emerged by the 30th day, the sacs were dissected to examine the contents. We also set aside egg sacs that were untreated to serve as a control group. We considered a pesticide to be effective if none of the 18 egg sacs had spiderling emergence. TEST RESULTS. In the first tests, we found that none of the water-based pesticides prevented the spiderlings from emerging from all the sacs (Figure 1, page 106). In fact, there was no statistical difference between emergence from water-based pesticide-treated sacs and the untreated controls. In contrast, the one petroleum-based aerosol (AI: cyfluthrin) that we tested killed the contents of all 18 sacs. Figure 4. Comparison of ability of pesticides to prevent brown widow spiderling emergence from egg sacs. Black = egg sac had no emergence. Gray = emergence from untreated egg sac. Blue = emergence from egg sac treated with water-based, ready-to-spray pesticide. Red = emergence from egg sac treated with petroleum-based (PB) aerosol pesticide. From this, we could see that, at least with the aerosol, the AI was sufficient to kill the egg-sac contents. We surmised that the critical aspect was whether or not the carrier could penetrate the silk layer to get the AI in contact with the egg-sac contents. To test this penetration aspect, in the second tests, we paired pesticide products that had the same active ingredient but different carriers. One pair of products contained cyfluthrin and the other contained deltamethrin. All four products were mixed with red stain that would allow us to confirm if the carrier had penetrated the silk layer and contacted the eggs inside the sac. We used sacs that were less than eight days old so that we would be testing only sacs containing eggs. As shown in Figure 2, egg sacs were completely dipped in the water-based pesticides. Petroleum-based aerosols were sprayed into a vial to which stain was added, and 10 microliters of the stained pesticide were applied to the side of the egg sacs. The sacs were left for 30 minutes then dissected. Figure 3. 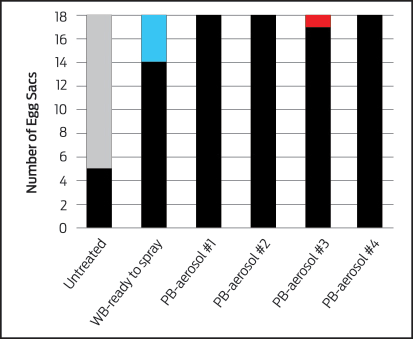 Comparison of water-based (blue) and petroleum-based (red) pesticides mixed with dye and applied to spider egg sacs. The water-based treated sacs had less than 0.1 percent dyed eggs while more than 99 percent of the petroleum-based treated sacs were dyed. 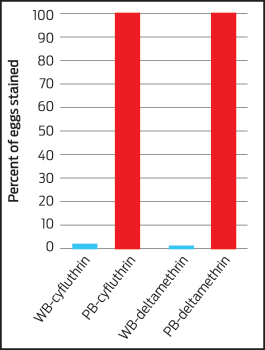 As shown in Figure 3, the sacs treated with water-based compounds had less than 0.1 percent of their eggs stained, whereas more than 99 percent of the eggs in the petroleum-based insecticides were stained. This meant that the ability of the pesticide to penetrate the egg sac silk was dependent upon the type of carrier: water-based pesticides were prevented from passing through the silk, whereas the petroleum-based pesticides passed through readily. APPLYING THE LESSONS LEARNED. 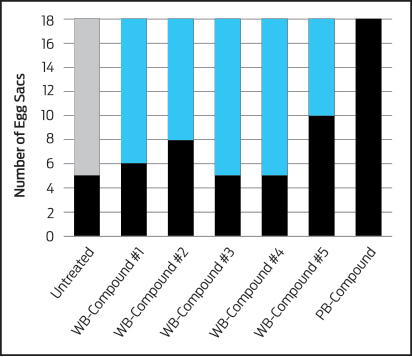 Using this information to confirm the penetration aspect, we ran a third series of tests similar to the first tests but using four petroleum-based pesticides and one water-based, ready-to-spray compound. As shown in Figure 4, the petroleum-based pesticides almost totally prevented the contents of the egg sacs from emerging, meaning that they controlled the spiderlings. There was greater survival in the water-based ready-to-spray pesticide tests than in the petroleum-based product tests, but it was still statistically better than the other water-based compounds used in the first test. There was some differential response inside the sac: some pesticides killed the contents of the one-day-old sacs while they were eggs, while some one-day-old sacs treated by other pesticides had spiderlings inside when dissected. These latter sacs showed that, although the pesticide prevented the spiderlings from emerging (i.e., it showed sufficient control), it didn’t stop them from hatching from eggs to spiderlings. This information may be useful for the PMP, although it probably won’t greatly change the way spider control is performed in the field. The results from our study show that spider silk prevents water-based pesticides from penetrating through the sac wall to contact the contents. So, if a stockpile of egg sacs from a spider like the brown widow is discovered in the corner on the underside of a picnic table, the PMP may want to use a non-water-based pesticide for spot-treatment of the egg sacs. A FINAL WORD. Although we used the brown widow spider as a model for the treatment of most spider egg sacs, this may be unnecessary for some spiders, such as cellar spiders or daddy longlegs, which are urban pests; they carry their egg sacs in their fangs and cover them with only a few strands of silk. If you are applying pesticide to control these spiders, it would seem that the water-based pesticides would work just fine because there is no silk layer to protect the eggs. Reference: Vetter, R.S., J. Tarango, K.A. Campbell, C. Tham, C.Y. Hayashi and D.-H. Choe. 2016. Efficacy of several pesticide products on brown widow spider (Araneae: Theridiidae) egg sacs and their penetration of pesticides through the egg sac silk. J. Econ. Entomol. 109: 267-272. Rick Vetter is a retired arachnologist from the University of California, Riverside (UCR). Dong-Hwan Choe is an UCR assistant cooperative extension specialist and assistant professor of entomology.